Terrorism, religious fanaticism and class wars are endemic in South Asian states. There is continuous cross-border terrorism which is but a proxy war between States. There are external economic and military threats from new and old hegemonic forces. There are threats from non-State actors like terrorists, pirates, human smugglers and illegal fishers. Add to this, money laundering, cybercrime and misuse of an uncontrolled social media to spread religious hate and ethnic and civil strife, the situation is as grim as it is mind-boggling. These issues were looked at by scholars from across South Asia at the Colombo Shangri-La Colloquium 2018 held here on Sunday under the aegis of the Institute of National Security Studies Sri Lanka (INSSSL). But today, thanks to the birth of nationalism and the emergence of nation-states, South Asia is one of the least integrated and one of the most conflict-ridden areas in Asia. Inaugurating the colloquium, Sri Lanka’s Defense Secretary Hemasiri Fernando said that Sri Lanka and South Asia face an “uncertain future” with cyber warfare becoming as much of a threat as nuclear warfare. “We need to be prepared for any eventuality,” he warned as he called for a knowledge-based approach fostered and sustained by “independent” think tanks working on material from independent sources. Fernando called for greater interaction and cooperation among scholars of the region and beyond to get the right, broad-based and realistic perspective on issues. The fact that countries in the region are yet to evolve as “nations” has given rise to internal strife, he said. 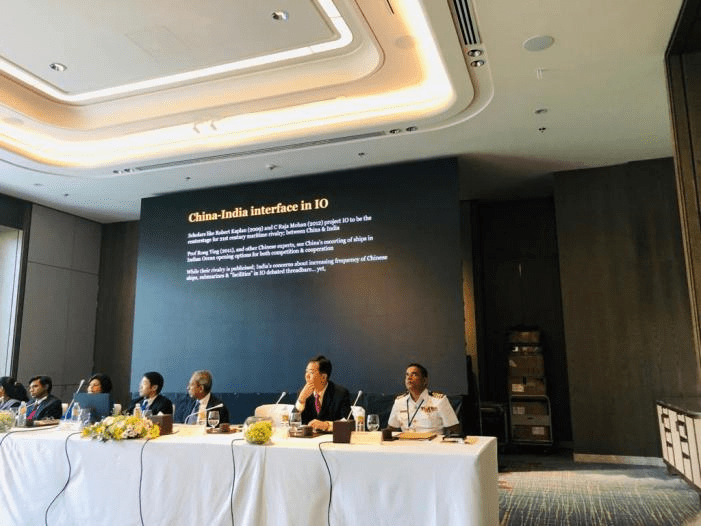 Prof. Asanga Abeyagoonasekera, Director General of the INSSSL described Asia as a “geopolitical hotspot” with increasing militarization following the rise of China as an economic and naval power. He pointed out that China’s naval growth has outstripped that of all major powers. The arms build-up in the region has been unprecedented in history, he said. Sirimavo Bandaranaike, Sri Lanka’s Prime Minister in the 1960s and 1970s had foreseen the present scenario and had proposed that the Indian Ocean be declared a Zone of Peace, he said. The region is currently divided into the Chinese and the US camps. Globalization is taking place at a time when there are “transformational changes” taking place in the region, Goonasekera noted, and wondered if in the midst of all these transformational changes, a new security architecture can be created. He quoted India’s former National Security Adviser Shivshankar Menon to say that it would be illogical to impose stability in a changing environment. Japanese scholar, Dr.Satoru Nagao, a Visiting Fellow at the Hudson Institute (US) maintained that China is aggressively expansionist and has occupied islands vacated by Western powers. He warned nations which are joining China’s Belt and Road Initiative (BRI) that China is a “sinking ship” which other nations had better abandon. He predicted that the US, the world’ only super power, will win the competition against China. Supporting the view that China is a threat to the region, the Maldivian speaker Dr.Rasheed Mohamed Didi said that when President Abdulla Yameen declared a State of Emergency in February 2018, and there was a talk of an Indian invasion to restore democracy, China had sent a Destroyer and at least two frigates along with 30,000 ton amphibian transport vessel with three tankers to support it. China is also building an observation post in an atoll in the West which is close to India, she said. According to Didi, it will be India and not China which will come to Maldives’ rescue in times of distress. But Prof.Huang Yunsong, Associate Dean at the China Center for South Asian Studies in Sichuan University, defended China in the face of allegations that China is driving South Asian nations into a debt trap. He said that the interest on 61.5% of China’s loans to Sri Lanka is far below the international market rate. “As of December 2017, Sri Lanka owed China US$ 5.5 billion which was about 10.6% of the island nation’s total foreign debt of US$ 51.8 billion. Of the US$ 5.5 billion, US$ 3.8 billion (61.5 % of the total loan) was provided at a rate far below the international market rate. Thus, the major part of China’s loan was taken at a concessionary rate,” Huang emphasized. “More importantly, US$ 1 billion had been taken at a concessionary rate of 2% which means that the interest on the major part of the loan was not excessive at all,” he added. Referring to the description of China’s taking over the Sri Lankan port at Hambantota as “neo-colonialism”, Huang said that if one were to Google “port 99 year lease”, the first result one would get is a 99-year lease on the Port of Darwin in Australia’s Northern Territory, a deal worth Australian Dollar 506 million with a Chinese company. Besides, port terminals in New York and Long Beach are managed by Chinese companies. But people do not term Darwin and Long Beach as China’s colonies!” Huang remarked. Reacting to a remark made by a former Indian National Security Advisor Shivshankar Menon that ports might begin as commercial ventures but ultimately end up as military bases also, Huang said that he is certain that at least in the short and medium terms, China has no plan to put the ports it is building overseas to military use. Former Sri Lankan diplomat HMGS Palihakkara said governments and researchers should eschew the “zero sum” approach and stress on the positives and the benefits of mutual cooperation rather than conflicts and differences. Picking up the theme of cooperation rather than conflict, Indian scholar Dr. Swaran Singh, a Senior Fellow at the INSSSL said that despite antagonism at the political level, Indian and Chinese navies have been cooperating in stamping out piracy in the Western Indian Ocean. He recalled an incident on Aprl 9, 2017 in the Gulf of Aden when Chinese and Indian navies jointly rescued a 21,000 ton cargo ship MV 0S 35 that had been hijacked in the Gulf of Aden. Dr.Singh said that there are three networks to contain piracy, run by NATO, EU and US. India and China are coordinating and assisting in the operation of these networks. India has repeatedly emphasized how it seeks to ensure that the Indo-Pacific arrangement or “Quad” does not become an exclusive Western allies‘ club. It is trying to get China on board in its Indo-Pacific deliberations. India and China are engaged in maritime dialogue but this is not highlighted in the media because of the inherently competitive nature of China-India equations, Dr.Singh said. Opening on the seminar on terrorism, Maj.Gen. Udaya Perera said that though terrorism took only a minuscule number of lives in the world, it has been a powerful propaganda tool for terrorism. Each time one talks of a terrorist deed, it is propaganda for the terrorists, he said. Terrorism cannot be fought by military means alone; it has to be fought at the political and social level too ,Gen.Perera said. Dr.Ranga Jayasuriya, Senior Fellow at INSSSL, said that “non-violent extremism” has to be studied as much as “violent extremism” as the former creates a suitable climate for the latter. He also pointed out that non-violent extremism is part of the armory of politicians to grab power and stay in power. It is as much part of majoritarian politics as it is of minority politics. Weak political institutions make countries a happy hunting ground for non-violent and violent extremism, Jayasuriya said. Maj.Gen.Muniruzzaman President of the Bangladesh Institute of Peace and Security Studies said that youth radicalization is a major problem in Bangladesh. Jobless economic growth, a poor educational system, which does not encourage or stimulate thought, and peer influence make the youth, who are 40% of the population, go for radical ideologies and modes of action which they find stimulating. There is no class distinctions here, he added. There is no system for rehabilitation. Prisons are places where terrorists or radicals are “recycled” because those who are jailed turn fellow inmates into radicals, Gen.Muniruzzaman said.